Inverness was the first depot in Scotland to receive any BR/Sulzer Type 2's. Nineteen would be delivered, all from Derby Works and were used alongside a number of BRCW Type 2's and English Electric Type 1's to oust steam from the Highlands. When delivered this Scottish batch represented the first major design variant of the class. Following the decision to abandon the disc/lamp method of train identification the Inverness bound locomotives were the first to feature the redesigned cab front and roof, the latter featuring a housing to enclose the four digit alpa-numeric displays, whilst the cab front presented a slightly less cluttered appearance with the absence of the discs and lights. They were also delivered from Derby Works with an external recess on the driver's cab side, to allow fitting of tablet catcher equipment at a later date. Brand new D5116 heads north from Skipton, presumably on its way to Scotland after having completed its acceptance trials at Derby. The view is probably taken during May 1960. It is perhaps ironic that Skipton would also witness the last movements of some of the Scottish Class 24's as some made their last journeys from storage at Carlisle to Doncaster Works for breaking up during 1976/77. But for now D5116 has sixteen years of service ahead of it and will be witness to some of the finest scenery to be seen from a railway line, including the next eighty miles along the Settle & Carlisle route. Another view of a pair of brand new Class 24s enroute from Derby Works to Inverness. The delivery of the nineteen Derby built Type 2's began with D5114 during the week of April 23, deliveries continued until September when D5132 reached Inverness. June was the busiest month for deliveries with D5119 - D5123 received. During October the locomotives visited St Rollox Works, Glasgow for the fitting of the tablet catcher equipment. Photograph courtesy BR ScR/collection Steve Morris. Not much information on this interesting view, but presumably in the early days of the class 24's at Inverness. The locomotive seems in pretty much as delivered condition apart from the addition of the small yellow warning panel. There was a substantial blockage on the line at Dava circa Feb/March 1963, possibly involving D5342 or D5344 - whether any of these views feature that event remains to be clarified. Photographs courtesy BR ScR/collection Steve Morris. 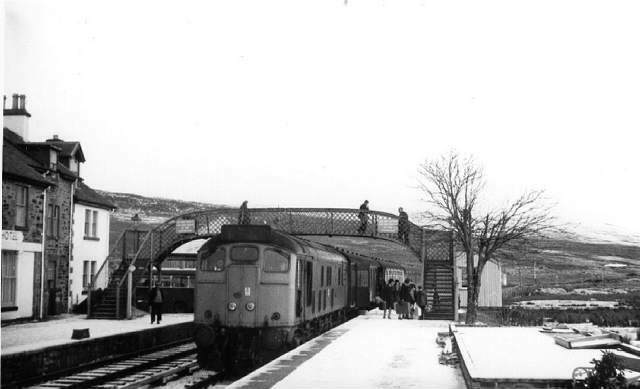 Although these views are taken from the later days of the Class 24's at Inverness, the Class 26 appears to be in blue and the class 24 has a full yellow cab front it shows some of the typical winter weather endured by the Type 2's in their fifteen years of service out of Inverness. There are no details to the views and it appears that the events may not be related, the third view appears to be the rescue of a snow covered Class 26, whilst the first two views appear to be snowplough duty involving a Class 26 & 24. Philip Wylie writes that two of these views (left & center) show the two locomotives and a snowplough derailed on the Dunphail side of Dava during the winter of 1962/63. 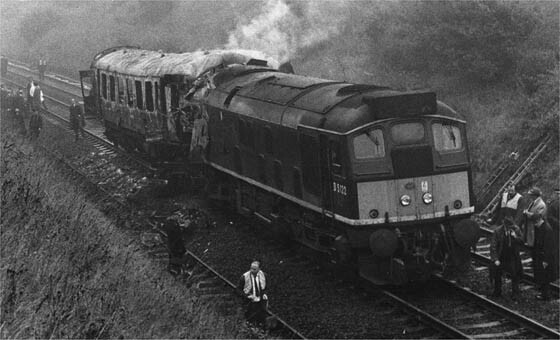 Philip remembers a news clip shown on ITV of the plough charging the drift, from the photo it appears the plough, and maybe the Class 26 has derailed. This may also have been the year when a Class 24 and four coaches became stranded for four days close to Forres whilst working an Inverness - Perth via Granton service. The right hand view is believed to be on the Far North Line near Altnabreac, possibly from the storms of 1978 that eventually led BR to carry emergency hampers on the wintertime train services. Sandy Anderson of Inverness writes of how the heavy snows affected the Forres, Dunphail, Dava, Grantown, Boat of Garten, Aviemore line as possibly depicted in some of the views above. 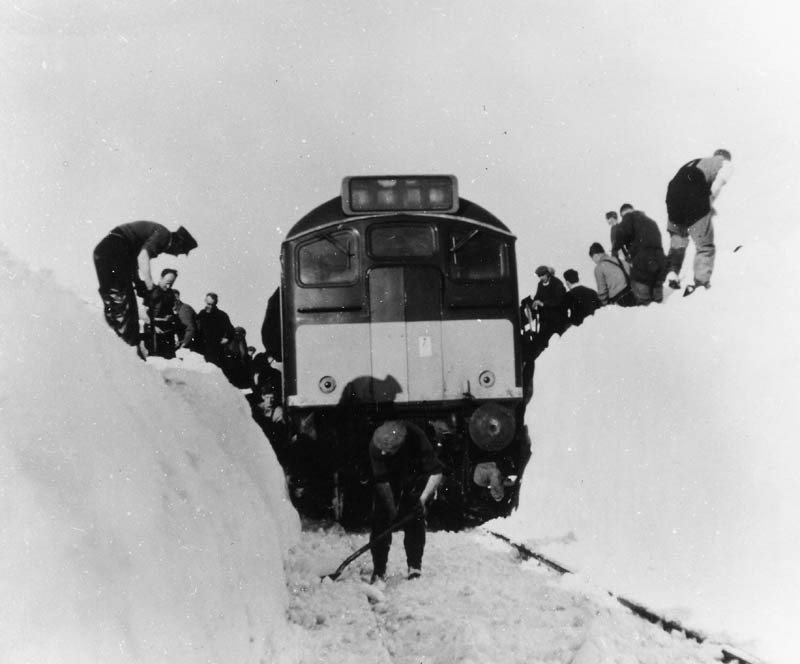 Since it was a Sunday the two London trains went south via the Dava line, with a plough driven by Inverness driver George Cooper becoming derailed at the summit of the Dava, this incident was covered by TV crews. The first London was held up at the Dava station and the second at Dunphail. The plough was rerailed by Sunday night and three trains proceeded to Grantown on Spey, a plough reversing back and a workmens train propelling followed by the plough. Sandy was fireman to Jock Glass and manned the workmens train. On the Monday or Tuesday we picked up a Digger on a low-loader from Forres, by this time the Londons had been removed. We spent most of the week digging out the cutting and a plough came from the Grantown end with two engines, when they hit the snow the glass protecting the emergency stop on the outside of one of the diesels broke and the lever pulled and the engines stopped! The plough was uncoupled and the engines reversed and pulled it out with a chain. In the meantime the workers tran was backed off a couple of miles and a flagman was stationed at the end of the block, it was cleared on the second attempt. The first week of November saw D5117 transferred to Eastfield (65A), to be used for trials on the Edinburgh - Glasgow services. D5326 was sent to Inverness in exchange whilst these trials were taking place. A month later, the week before Christmas, D5116 headed south, transferred to Polmadie (66A). D5329 & D5336 were transferred to Inverness at this time. 5123 awaits its next turn of duty at an unknown location. It sports the tablet catcher, fitted after delivery to the Scottish Region. The curved roof cover for the boiler filler access has gone, as has the windscreen wiper from the second man's side of the locomotive. The locomotive also carries one of the smaller, weight saving boiler water tanks. From the Rex Conway collection. It appears that 5125 & 5121 are not long out of Derby Works, judging by the shiny paint and lack of exhaust stains on the roof. Tablet catchers have not yet been fitted and the curved roof panel for accessing the boiler filler is actually in place. In later years Glasgow would sheet this over, no doubt to ease maintenance and remove another spot on the locomotive prone to ice damage in winter. For the week ending April 15 D5117 moved to Leith (64H). During June the adventuring D5116 & D5117 returned to Inverness, D5116 the week ending June 3 & D5117 the week ending June 17. Photographs courtesy R N Joanes. Three views taken on April 18th 1961 show D5120 running round its train that it has just brought in from Inverness. It is then seen ready to leave Wick with its next working back to Inverness. In the last view it is seen arriving at Georgemas Junction as steam locomotive 40150 awaits with the train brought in from Thurso. 40150 would be one of the casualties of the success of the Class 24/26's in taking over all the services north of Inverness. D5120 is in as-delivered condition from Derby Works, but has gained the three piece miniature snowploughs and the tablet catcher equipment. With the diesels settling in the outlook appeared grim for the steam sub-sheds at Helmsdale, Kyle of Lochalsh and Wick. The greater versatility of the diesels allowed them to take over the various shunting duties as part of their their regular diagrams. This soon led to the aforementioned sub-sheds losing their allocations and eventually closing completely. Elsewhere by September the Aberdeen - Inverness line was almost totally in the hands of diesels and the West Highland line would soon see its last regular steam locomotives with the arrival of the BRCW Class 27's. The Perth re-signalling scheme, completed March 26-27, led to considerably less train re-marshalling/locomotive changing taking place there. More through running from Inverness to Glasgow/Edinburgh commenced, with Edinburgh now having three through diesel hauled services from Inverness, at 8.20am, 11.00am & 3.45pm. On May 7 all remaining steam hauled passenger trains at Edinburgh Waverley changed to diesel traction. 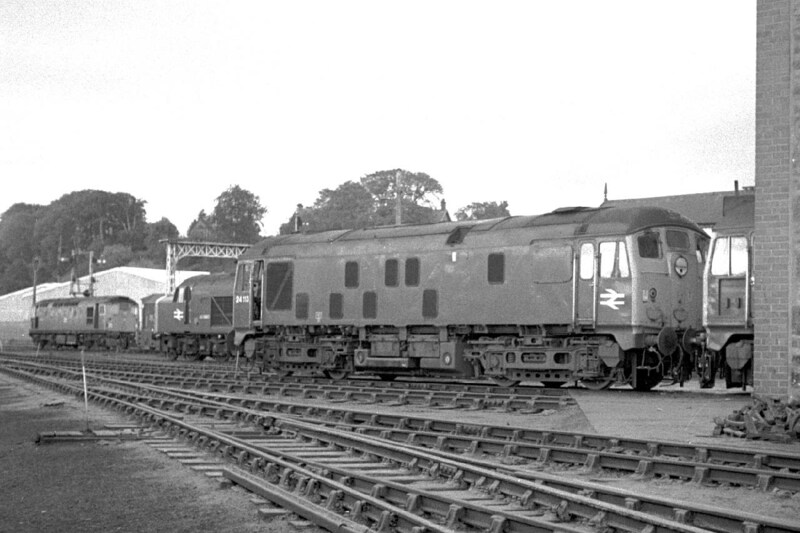 Although all the Class 24's at Inverness had been built at Derby they would rarely return there for overhaul. The first choice for scheduled heavy repair was the former GNSR workshops at Inverurie, when this closed they were sent to the workshops at St Rollox, Glasgow. Noted at Inverurie in February was D5121. Photographer unknown. An unknown photographer touring Scotland in the summer of 1962 exposed a roll of film featuring their travels on British Railways. These three views from July 20th 1962 feature D5337 on the local Aberfeldy - Ballinluig working, a working that was part of an Inverness diagram. The locomotive from the Aberfeldy branch returned to Perth each morning, from here it worked the 12.17 down service to Inverness via Forres, running just ahead of this working was the 12.05 direct service to Inverness. The crew working the 12.17 down service had previously worked the Up Royal Highlander, lodging in the Perth Railway Hostel before taking up the 12.17. I hope you enjoy these views, the detail captured in them is impressive and represents a time now long gone from the railways. The first views indicates that a rain shower has just occurred, the platform is slightly damp, by the time the train is set to leave in the second view the sun is out and the platform is dry once again. The views, picked up on Ebay (the seller living in Lairg) were still in their original yellow Kodak sleeve, which on the reverse referenced 'Kodak, New Zealand', pictures seemingly almost as well travelled as the Class 26's. The Aberfeldy branch lost its passenger service from May 3rd 1965. A reader who stopped by the site, Dave Walker wrote that he rode this branch as a child until the branch closed. Because the branch line working was normally one coach and the locomotive, Dave always remembers the sound of the diesel locomotive as it made its way up and down the branch. He remembers the coach was non-corridor and had the old style leather belt window openers. After the branch closed Dave had to ride buses to Perth, a poor substitute after the personality & charm of the Aberfeldy branch. Its a damp March 10th 1962 as D5121 stands at Inverness with its train for a Far North or Kyle service. D5121 has been in service for about 21 months, the tablet catcher has been fitted and the roof mounted boiler water tank filler cover is still in place, but not fitting too well. Its August 1963 and the Class 24's have been at Inverness for about three years, 5126 has changed a little since delivery from Derby. A yellow warning panel with rounded upper corners has been added. At the other end the tablet catcher equipment is just visible. From a photograph by Mike MacDonald. On May 3rd the Aberfeldy branch closed, this released an Inverness Type 2 to be diagrammed for a late afternoon Glasgow - Dundee - Glasgow working. The Inverness allocation as at October 30 was: 2413/22/23/24, 3735, 3896, 4095/96, 5114 - 5132, 5320 - 5346 & 8031 - 8034. The wanderings of the Inverness Type 2's increased when the 20.25 Perth - Carlisle parcels was dieselised from March 2nd, on that first day D5119 was used, returning with the following morning's 06.10 Carlisle - Perth parcels. Increased coal output from collieries in the Ayr region found D5116 borrowed for at least a week to assist with the extra movements. Perth depot on August 17th 1967 finds D5127, D5132 & D3541 on shed. D5127 sports the blanking plate with four slits in it, whilst D5132 is on its way to the Works for repairs to the No.1 cab. On December 31st the Inverness allocation was: 2423, 3735, 4095/96, 5114 - 5132, 5316 - 5346. For reasons unknown, perhaps due to diagramming changes the Inverness Type 2's started to appear on the Waverley route passenger workings. On September 9th 5122 had been diagrammed to work an early morning passenger train from Perth to Glasgow Queen Street. On its return trip it left Queen Street just before 9am to work back light engine to Perth. Ahead of it was the 08.46 Glasgow - Edinburgh passenger dmu formed of a six car InterCity unit. On the approaches to Greenhill Upper Junction this train was brought to a halt under the protection of signals just short of the closed Castlecary station, due a train crossing over the junction ahead of them. Following the diesel multiple unit was 5122 which was also brought to a halt whilst the conflicting movement ahead of them cleared. There had also been a track circuit failure at Upper Greenhill which was causing delays and led to the presence of several Signal & Telegraph staff in the area. Confusion with the train crews contacting the signalman over the delays to the stopped train led to the second man of the Class 24 acting on the instruction intended for the 08.46 unit. The instruction allowed for the passing of a signal at danger, but in doing so the driver of 5122 accelerated to a speed that was considered unsafe in light of there being a possible undetermined obstruction ahead. The S & T staff had the misfortune to witness the sudden arrival of the Class 24 at the point where the 08.46 unit was still standing. Despite trying to attract the attention of the driver there was insufficient room to bring the locomotive to a halt. The impact took place at about 35mph with the locomotive embedding itself in the rear power car - SC79092. Shortly after the collision the 08.30 Edinburgh - Glasgow diesel multiple unit arrived on the scene, recognising the obstruction at the rear of the unit the driver made an emergency brake application but was not swift enough to prevent his train from striking some metal displaced from the locomotive, damage to the unit was insignificant. Unable to provide any assistance to the trains involved this train left the scene, shortly after which fire broke out engulfing the cab area of the locomotive and all of the power car. The leading five vehicles had by this time been detached. For the locomotive the collision destroyed the No.2 (leading) cab and boiler room. The main frames were broken and distorted with the engine & boiler room bulkheads damaged. The whole of the driving controls, electrical wiring and fittings in the No 2 cab were destroyed. The leading bogie was derailed as was one set of wheels of the DMU's bogie. Regretably the locomotive driver and his assistant were killed instantly, whilst three passengers were injured on the unit. Surprisingly the track sustained only minor damage, service over the line was re-established at 2.30pm that day. The damaged vehicles were moved to Bonnybridge, remaining there until September 24th, when movement took place to Eastfield. Withdrawal occurred in September, the locomotive reaching Glasgow Works by October. Possibly the transfer of 5318 to Inverness was effected to cover the loss of 5122. On December 31st the Inverness allocation was: 2423, 3211, 3548, 3660, 3735, 3896, 4095, 5114 - 5121/5123 - 5132, 5320 - 5346. Reflecting recent diagram changes, here is D5116 at Hawick working a local over the Waverley route. The route had been host to the Haymarket based examples for a while. D5116 features one of Inverness's home grown modifications - the metal stripping around the door seams on the now disused cab front connecting doors. 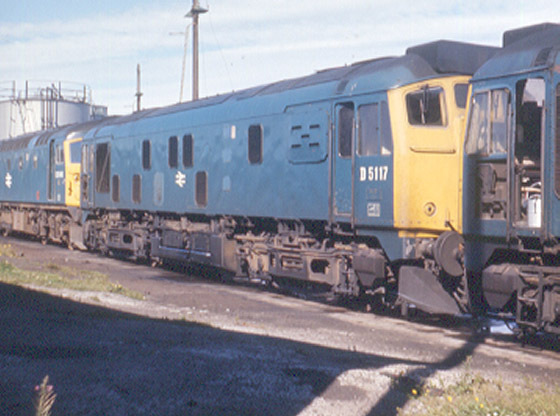 Photograph courtesy Grahame Wareham A fine sunny August 1971 day at Inverness highlights 5115, truly a Scottish machine complete with headlights, snowploughs, tablet catchers and unique boiler room blanking plates. On January 4th the Carlisle - Edinburgh 'Waverley' route closed, a route occasionally travelled by the Inverness allocated Type 2's. The line to Kyle was blocked in early November by a landslide at Strathcarron, stranding 5125 and some coaches west of the blockage. Attempts to clear the line revealed a segment of unstable strata which eventually required the construction of a snowshed type structure. Enough of the line had been cleared by January 5th to allow 5125 to be gingerly shunted across a temporary length of track allowing it to return to its more normal duties. The line would not re-open until March 15 1970. Photograph courtesy Geoffrey Robinson/Collection N Ross This view taken in November 1969 shows 5124 arriving at Kyle of Lochalsh with the shuttle service from Stromeferry. Between there and Strathcarron a shuttle bus service was in effect. Photograph courtesy Geoffrey Robinson/Collection N Ross 5116 arrives at Achnasheen with the truncated 10.30am Inverness - Kyle of Lochalsh service on a wintry looking day in November 1969. On December 31st the Inverness allocation was: 2423, 3211, 3548/51/55, 3660, 3735, 3896, 5114 - 5121/5123 - 5132, 5330 - 5346. Kyle of Lochalsh - Inverness 17.50 passenger. Inverness - Kyle of Lochalsh 17.40 passenger. In the Far North three locomotives stable overnight, two at Wick and one at Thurso. Thurso - Georgemas Junction 05.15 where the train combines and the Thurso locomotive is removed. The second Wick locomotive works the 05.59 Wick - Georgemas Junction goods, at Georgemas this train is taken over by the ex-Thurso passenger locomotive which then works the goods train through to Inverness, returning with the Inverness - Wick 17.00 passenger. The second Wick locomotive eventually ends its day at Thurso. Inverness - Wick 06.42 goods, waiting overnight at Wick to handle the next day's goods working. Wick - Inverness 17.20 passenger. Inverness - Lairg 08.23 goods. Inverness - Invergordon 09.17 goods. Inverness - Invergordon 11.15 goods. On December 31st the Inverness allocation was: 2423, 3551/55, 3660, 3735, 3896, 5114 - 5121/5123 - 5132, 5330 - 5346. An interesting view showing how two designs fulfilled the Type 2 requirement. Here 5118 & 5343 are photographed on a Wester Ross railtour at Dingwall. The Class 24 shows the original design whilst the Class 26 shows the cleaner lines which would be incorporated in the Class 25 redesign, even the layout of the fuel/water tank and batteries would be similar. Two Inverness Class 24's with all their Scottish regalia await their next turn of duty over the Highland line. The date is not known. At the end of May the Inverness harbour job was converted to a Class 08 working. This released Inverness's solitary Class 06 for further duties, this time at Aberdeen (61B). A collision at Inverness depot between 5131 & 6855 led to considerable damage to both locomotives, eventually leading to the withdrawal of 5131 during September. By October 5131 had reached Glasgow Works. Another recorded diagram: the Inverness - Keith 17.00 goods additionally worked trips to Aberlour & Elgin. This locomotive would combine with that off the Craiginches - Keith 14.00 goods and then work the Elgin - Aberdeen, Guild Street 17.28 goods. A visit to Glasgow Works during November found that the remains of 5122 (withdrawn September 1968) had finally been disposed of whilst the undamaged cab from 5131 had been transplanted on to 5115. A view from August 1971 finds 5117 awaiting its next turn of duty at Inverness depot. Three years after steam has finished it still carries its 'D' prefix, and carries all its Inverness regalia - headlights, tablet catchers, unique boiler room blanking plates and snowploughs. On December 31st the Inverness allocation was: 3551/55, 3660, 3735/87, 3896, 5114 - 5121/5123 - 5130/5132, 5330 - 5346. A new arrival at Inverness during April was 5113. This locomotive differed from the other Class 24's here because it did not carry the roof mounted headcode box, being the last Class 24 built in the lamp/disc style. A fine panned shot taken in January 1972 of 5132 passing Inverness depot with a service from the Far North Line. Once passed the depot the train would then back into the platforms that serviced the southbound services, providing connecting passengers with easier access to the trains to Aberdeen, Edinburgh or Glasgow. A new working for Inverness was the temporary flow of North Sea pipes from Invergordon (recieved by ship from Japan) to Gateshead. Here they underwent a special treatment, then returned to Invergordon. 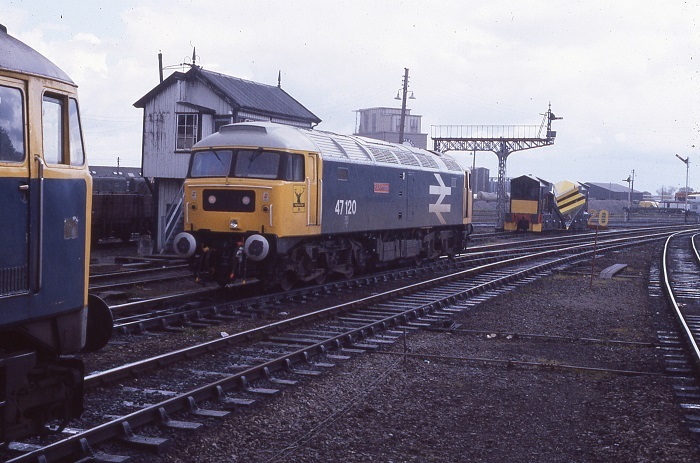 The inaugural working was by a pair of Class 24's. This working ceased once a special treatment plant was constructed at Invergordon. 5114 was retired during October. 5116 and a Class 26 await their next turn of duty at Edinburgh Waverley, date unknown. Although the tablet catcher has been removed it still carries many of its 'Scottish' features - the twin sealed beam headlights, the customised boiler room blanking plate and several other enhancements unique to the Inverness machines. An unidentified Class 24 waits at Lairg on a dull, damp day sometime during 1972. By February 5114 had finally reached Glasgow Works for stripping & eventual scrapping. 5101 was transferred during February to Inverness, but immediately returned to Eastfield, presumably the physical transfer never took place. However 5329 did move to Inverness that same month as did 5327 during April. 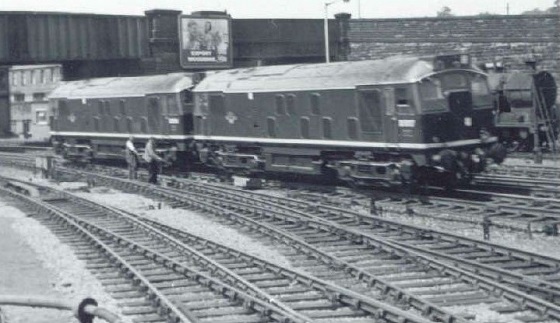 The slow dismemberment of 5114 continued at Glasgow, by August both cabs were missing, reportedly shipped down to Derby Works and used on 5055. After a stay of eighteen months 5113 was transferred back to Eastfield. A sign of the times to come was the transfer of 47516 from Haymarket to Inverness on December 2, the 08.45 Edinburgh - Inverness being used to effect the transfer. Initially used for driver training it was also regularly found working the overnight Milburn - Millerhill as far as Perth, returning on a northbound parcels. It was also to be found on the 'Royal Highlander' & 'Clansman' passenger workings. 5112 & 5113 were transferred from Eastfield to Inverness during February. Photograph courtesy Tony Sayer Recent arrival 24113 waits outside the shed at Inverness on October 2nd 1974. This was the last Class 24 to be built with the train identification discs and lights mounted on the cab front. 24102, 24103, 24104 were transferred from Eastfield to Inverness during May. With the new timetables came an increase of Type 4 workings over the Highland line, with eight services north of Perth now in the hands of Classes 40 & 47. To some extent this had been made possible by the recent transfer of thirty six diesels from England to Scotland. 47516 returned to Haymarket in June. 24111 moved to Inverness during December. As the year closed out more Type 4's were drafted in to oust the paired Type 2's on the Highland line. The displaced Type 2's were found in charge of many freights. A broad view of the fuelling point at Inverness finds 24119 keeping company with three Class 26's on October 2, 1974. From the collection of Tony Sayer. Five days after the above view an ex-works Class 24, possibly 24123, shunts parcels wagons at Kyle of Lochalsh. There is little exhaust residue on the roof and the miniature snowploughs and cab front are remarkably clean, the locomotive must have been recently outshopped from Glasgow Works. 24111 returned to Eastfield during March. 24110 moved to Inverness in May. Class 40's were now very prominent on the Inverness - Edinburgh/Glasgow passenger workings. South of the border brought major upheavels for the Class 24 fleet with many stored/withdrawn. During August all of Eastfield's Class 24's were stored, the only Inverness locomotive stored was 24104. However all the Inverness allocated Class 24's had their sealed beam headlights removed and possibly their boilers isolated. A number of Class 26's had headlights fitted at this time. 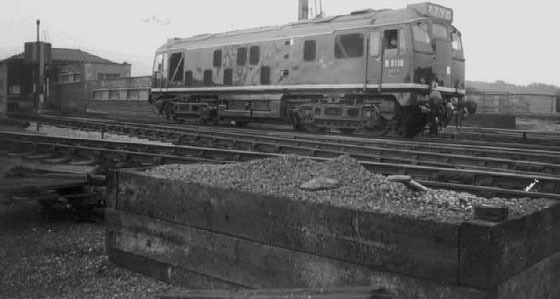 Time was now short for the original Inverness fleet, three had already been withdrawn, and after fifteen years service and with a continuing surplus of locomotives it was no surprise to find that between September and November all the Inverness Class 24's either moved to Haymarket or were put to store. October: 24102, 24103, 24132 to store; 24113, 24115, 24116, 24118 to Haymarket. November: 24125 to store; 24117, 24119, 24124, 24127, 24129, 24130 to Haymarket. With this batch of transfers Inverness said farewell to its allocation of Class 24's, for all apart from 24116 & 24117 this was their first transfer. However with the locomotives now based at Haymarket they were still regularly diagrammed for passenger workings to Inverness and could be frequently seen over the Highland mainline at least until October 1976. To cover the loss of these machines nine Class 26's were transferred in from Haymarket whilst Inverness received its first allocation of Class 25's: 25030, 25031, 25092, 25093, 25096. On November 12 a Glasgow Queen St. - Oban service was handled by 24117. This line was no stranger to the Class 24's, though it was normally those from Eastfield depot that would be seen on this line. A somewhat out of the ordinairy trip was had by 24121 on April 6 whilst working the 15.35 Inverness - Edinburgh with 26034. After the Class 26 failed at Kingussie 25029 was used to assist. However it was reported that parts had been seen falling off the Class 25, this was removed leaving 24121 to soldier on alone, arriving two hours late! During May 25030, 25031, 25092, 25093, 25096 were all transferred back to Eastfield leaving only Classes 08 & 26 on allocation at Inverness. The absence of Class 25's was brief, during June 25062, 25064, 25083 were transferred to Inverness. 25092 & 25093 also returned to Inverness in July, but were quickly returned to Eastfield by month end. A return to earlier times occurred when 24129 & 24130 worked the 12.15 Inverness - Glasgow on August 11. The previous day 40123 had failed at Dalwhinnie whilst working the 09.35 Glasgow/Edinburgh - Inverness. 24112 arrived to rescue the train, with 26009 added at Aviemore. As well as forays on the Highland mainline the former Inverness Class 24's were frequently turned out for other passenger workings. The infamous 1E83 Edinburgh - Berwick was well known for its variety of locomotives rostered, Class 24's were no exception, 24115 being noted on September 15. 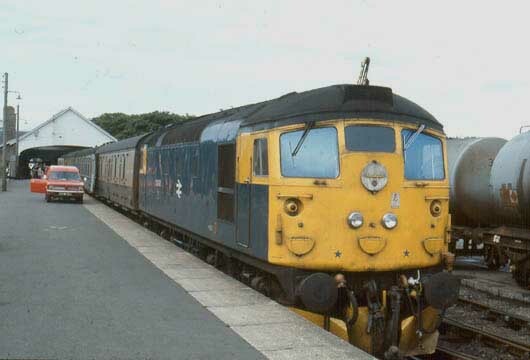 Likewise the Edinburgh - Aberdeen services occasionally featured the Class 24's. On September 17 24115 & 24120 worked the 07.40 Aberdeen - Edinburgh, whilst on September 30 24120 & 24104 handled the 12.30 Aberdeen - Edinburgh. The end of the summer timetable brought a deathknell to the remaining ex-Inverness Class 24's, with the few remaining examples stored by October, though official withdrawal did not occur until December. The only remaining operational Class 24's were now allocated to Crewe. On December 31st the Inverness allocation was: 08568/620/728/855, 25062/64/83, 26008 - 15/17 - 19/21 - 46. 24104 stands at Inverness Depot June 7 1976. Originally allocated to Gateshead, it became one of ten locomotives dedicated to the Tyne Dock - Consett iron ore trains. Still visible above the buffer beam is the extra air pipe fitted, used to operate the doors on the iron ore wagons. 24104 worked out of Inverness from May 1974 until stored in August 1975, though it was later reinstated to Haymarket. With less than a month left in service 24123 stands at Inverness, June 7th 1976. In placing the tablet catcher recess under the driver's window, a minor design change to the window was required. The previous droplight windows were replaced by a sliding window, which became standard on the Class 25's. With the introduction of the May timetable the following Class 25's were added to the Inverness fleet : 25068, 25226/228/229/231/233/234/238. On December 31st the Inverness allocation was: 08568/620/728/738, 25062/64/68/83, 25226/228/229/231/233/234/238, 26008/10 - 15/18/19/21 - 46. Again the May timetable changes saw an alteration to the Class 25 fleet at Inverness. This time 25083, 25226/228/229/231/233/234/238 were transferred to Eastfield, leaving just 25062/64/68 at Inverness. The loss of the Class 25's was perhaps made good in the transfer of six ETH equipped Class 47's to Inverness. On December 31st the Inverness allocation was: 08568/620/728/738, 25062/66/68, 26013/14/15/18/19/21 - 46, 47464/465/469/472, 47546/550. During June 25062/66/68 were sent to Eastfield in exchange for 20007/20/85. This left Inverness without any Class 25 on allocation. There would be no further Class 25 allocations at Inverness, although examples from other depots, particularly Eastfield could still be found visiting the Highland capital. 24015/16/71, 24117 Glasgow Works - Doncaster May 3 1976, (behind 26046 at Berwick). 24019/66, 24102/121 07.00 Carlisle - Doncaster 9Z14 February 14 1978. From the collection of Kevin Hughes. On December 2nd 1983 our scribe set out on a weekend trip from Derby to Kyle of Lochalsh, using a BR free pass, to obtain some Class 26 mileage. Extra points need to be given to Mr B for attempting this in deepest mid-winter, probably hatched from plans thought up in a dimly lit, smoke filled Derby hostelry. As with any exits from Derby a Class 45 is recommended, in this case 45102 on the short hop to Birmingham New Street, followed by some fine use of 85011 on the 1S87 18.00 Birmingham - Glasgow. A dash across to Queen Street finds 47519 at the head of the 1N05 23.30 to Inverness, departure being assisted by 37051 banking. Beyond Perth its up to 47412 to handle the run over the Highland main line. "The line from Inverness to Kyle is not notable for locos being on full power but the stately progress and spectacular scenery more than make up for this. 26043 burbled along quite sweetly and arrived at Kyle on time, there being plenty of turn round time in the timetable. Before going off for some liquid refreshment I waited to watch and photograph 26043 whilst it ran round its three coaches. The loco moved away towards the buffer stops and cleared the points. For some reason the loco kept shutting down when attempts were made to run it past the coaches, all was clearly not well! It would move, but only in one direction, towards the buffer stops, beyond which was Kyle harbour! I approached the driver who was, by now, on his way to phone Inverness, making myself known (the usual Derby Loco Works, anything I can do trick). We both returned to 26043, upon entering the engine room it resembled a scaled down Class 45, particularly the electrical equipment (both Crompton Parkinson), so at least I had some idea where everything was. The first job was to remove the electrical control cubicle doors in order to observe what the contactors were up to (or not, as the case may be!). The driver started the loco, then with the straight air brake full on, a slight power application was applied. All the motor contacts made, situation normal - although still in the direction of the harbour! 'Right mate, power off and put her in the other gear and try it'. The reverser threw over normally, but when power was applied the engine shut down straight away. I soon discovered that the engine stop contact was energising instead of the power control relay, and proved when the loco did actually power as the 'PC' contact would energise. The star of our winter's tale is seen here at Thurso on June 21 1978. The water temperature and oil pressure readings seemed OK, also there was sufficient oil on the rather huge dipstick. I hit on the idea of wedging the 'ES' relay to see what would happen, based on the 'it only goes bang once' theory and also in the light that a rescue loco had been despatched by Inverness, although it wouldn't arrive for another couple of hours at least. A phone call was made to Inverness depot to tell them of my plans, they suggested putting plastic tape on the contacts. I persuaded them otherwise as there was the risk that the sharp edges of the contacts might pierce the tape, causing the engine to shut down. Eventually they agreed to the wedging idea. The trial wedge consisted of a number of lollipop sticks. They were slid in one by one until the contact arm would not move. The driver then started 26043 and tried it first in the forward direction, towards the buffer stops. However he jumped out of the seat when it came to trying it in the other direction, 'I'm no trying it that way pal, you do it'. With a feeling of great dread I sat in the seat, put the reverser handle over to 'forward' and applied power, fully expecting a loud bang. What a joyous sight when the ammeter sailed round and we moved off, in the intended direction. At this point I went off to manufacture a more permanent wedge which would not fall out when we were on the move. By this time the unusual events happening to the loco had circulated around the seventy passengers awaiting departure, it did not go un-noticed that a fellow tourist was repairing the loco. Now suitably armed with various different sizes of little wooden blocks I returned to 26043 which was, by now, attached to the relevent end of the train and ready for departure. Since the driver declared that the engine could not now be shut down from the stop button (the stop relay being isolated) it was necessary to isolate the batteries prior to departure. The faithful lollipop sticks were removed, with one of the more substantial wooden wedges hammered into place. And so off we set, I rode in the back cab, departure was a mere fifteen minutes late to a round of applause from the passengers and station staff. At Strathcarron we met 26041 being driven by a relative of the driver of 26043. No time was wasted in pairing up the locos. The multi working was not connected though. 26043 was shut down so the wedge could be removed, then re-started and left idling so that the steam heating boiler could operate. And so 26041 powered us on our way to Inverness. On arrival a bowler hatted gentleman was waiting, a hasty withdrawal was made from the cab of 26043, quickly assuming 'member of the public mode', not wanting a roasting from officialdom for being in the cab without a permit. However the driver spotted me and introduced me to the gentleman, the big boss of Inverness. He shook my hand and thanked me for what I had done, which had allowed a number of passengers to connect with the Euston service. Then followed a short walk with the driver to the Staff Association club for some beers!!!" Although our story ends here, Mr B's journey continued on the 1G18 16.30 Inverness - Edinburgh as far as Perth behind 47519. The leg to Glasgow Queen Street utilised the 2T51 Perth - Glasgow behind 27048. 86219 did the honours on the 1V61 23.55 Glasgow Central - Bristol as far as Birmingham. 45124 was on the 1E75 08.10 Birmingham - York to finish the trip off at Derby on the morning of December 4th. Nothing at all to do with Inverness, but it is on the Glasgow - Inverness route and it is a Sulzer powered locomotive, and I like the picture! An unidentified green liveried Class 27 (tablet catcher equipped at one time) throttles up with a Glasgow - Dundee service depositing quite an impressive exhaust over the station, & no doubt accompanied by that familiar and unmistakeable Sulzer beat. At one time Inverness had a small fleet of Class 06's for working in the dock area and other locations with restricted access. Whilst the date & location of this view of 2423 are unknown it could well be at Inverness. The small shunter remained allocated to Inverness until May 1971, at which time a Class 08 took over its duties. A busy station scene at Inverness, date unknown - one of the Swindon dmu's diagrammed for the Aberdeen workings awaits departure. My full time employment was not with British Rail and since overnight excursions from the East Midlands did not reach Inverness (the nearest being Aberdeen), it would require a considerable outlay to reach Inverness and this did not happen until September 1976. The new order cometh, well not quite, just a lick of new paint and some fancy embloms finds 47120 at Inverness on June 10th 1985. Although very common over the Highland mainline the Class 47's would also spend some time on the Inverness - Aberdeen service and one at least is reported to have reached Kyle of Lochalsh on an excursion. Numerous visits had been made to the Edinburgh & Glasgow area prior to September 25th 1976, with Haymarket, Polmadie & Eastfield always turning out a good showing of the Class 24's. However the aforementioned date was set for a weekend visit to Inverness, my first to the Highland capital. With vast chunks of cash handed over to the man behind the ticket window at Derby it was with a fair amount of trepidation that I boarded a Birmingham - York service, hauled by a trusty 45050. Now in all fairness to Saltley and their allocation of motive power, it might have been wiser to have turned out Noah's Ark for this whole trip, because it never stopped raining. A soggy York was reached where a Kings Cross - Edinburgh service hauled by 47552 wended its wet way to Edinburgh. What rain that wasn't falling in England appeared to have selected Edinburgh for unleashing. Deciding that Haymarket depot wasn't worth drowning for, accomodation was found and the wet remants of the day were spent around Waverley. Hope springs eternal and the arrival of a new day, Sunday, brought the promise of my first run along the Highland mainline to Inverness. Of course it was still raining, it had to be. Waverley glistened, as did 40086 diagrammed for the journey via Perth. Haymarket produced a number of Class 24's - 24094, 24119/124/129, by this time most were in store, though 24129 was seen to be running. A shunting manouevre at Perth required the use of 08276, where it was still raining. The Highland mainline was as majestic as ever, still raining, but enlightened by the knowledge that this was necessary for the production of a well known Scottish beverage. The Class 40 on the front end did its job and arrival at Inverness was more or less on time. Permission was granted for a visit round the depot, what else could one do in Inverness on a wet Sunday afternoon? Despite this being the twilight hours for the Class 24's and their northern visits were becoming rarer, the depot revealed a glistening 24112 parked behind the fuelling shack. After the required photographs, not easy in the failing overcast afternoon light, the other locomotives on the depot were noted, surprisingly a great variety - Classes 08/24-27/40/47 as well as a number of DMU's. It was left for 40072 to work its magic back south to Edinburgh, as the rain beat down on the hotel that night thoughts were of Highland Sulzers from days gone by. A September 1976 weekend visit to Edinburgh & Inverness found only 24112 at the latter. There was now little time left for the Scottish 24's and this very rainy weekend did not seem to provide a fitting backdrop for my 'last look' at them working in the Highlands. Monday proved as soggy as ever, so a trip was made to Glasgow using 27203 & 27209, returning with 27112 & 27210. As the overcast skies were still delivering the wet stuff the trudge to Polmadie & Eastfield was forgotten. Glasgow Queen Street did turn up a very tired looking 27015, as it turned out this Class 27 was soon to be withdrawn, fortunately it was captured on film. Back at Waverley and with the sunshine as far away as ever 47528 was selected for a run south on the ECML. A few miles closer to the equator did not help, Newcastle proved if it was raining in Edinburgh, then it would rain harder at Newcastle, and it did! After persevering for a couple of hours watching 03170 shunt rain soaked parcels vehicles amidst the ever busy DMU's the arrival of 45073 on a service to Bristol marked the last leg of this adventure. Comfortably ensconced in the leading Mk2 with the rain running horizontal across the windows, it was left for this mighty fine Sulzer to plough its way south-west and home to Derby. The next visit to Inverness was by car, as part of a grand camping tour of Scotland, the campsite for Inverness being situated at Bunchrew, just a few miles north of the Highland capital. By this time a Class 24 had not worked in Scotland for over six months, but a visit to Inverness depot on the afternoon of June 28th found the ever present Class 25/26/40/47's on hand. Scotland did still hold on to a few withdrawn Class 24's, on this trip 24009, 24128/147 were at Carstairs, 24121 was at Polmadie, 24006 at Eastfield, 24106 at Millerhill, with over a dozen still parked at Carlisle Kingmoor. No Scottish Class 24's would reach preservation. It's been about nine months since the last visit of a Class 24 to Inverness. Now the Class 26's have complete control of local passenger services. Waiting at the fuelling point for its chance to be re-victualled is 26011 attached to 26018, seen here on June 28th 1977. Finding a Class 25 at Inverness depot was clearly no scoop for yours truly, but it was used to frame 26027 as it worked its way on to the depot on June 28 1977. Of course in hindsight one should have photographed everything in sight, but that was not to be. A look inside the depot finds three Class 26's in between duties, no doubt receiving a variety of exams and maintenance work. Seen here are 26029, 26043 and 26031 on June 28th 1977. A Class 40 is carefully positioned by the fuelling shack at Inverness on June 28th 1977. Waiting their turn for fuel and water are 26038 and 26011. Almost a year would pass before a return visit was made to Inverness, again on the annual camping extravaganza. Having arrived from Aberdeen on June 20th and pitched tent at Bunchrew, the next day saw the morning train to Wick/Thurso being taken for a day out in the Far North. 26046 did the honours to Georgemas, where 26043 took over for the run down to Thurso. The return trip south was in the hands of 26026 & 26034. A visit to the depot revealed the expected Class 25/26's, though the Class 40's were not so evident this time round. The only Class 24 remaining in Scotland was Eastfield's resident wreck 24006. Our train to Georgmas Junction with 26046 waits at Inverness for all the station work to be done. The next soiree to Inverness was part of a weekend marathon, the Wirral Railway Circle's 'Orcadian' from Liverpool to the Orkneys. 47274 did the honours to Edinburgh, 47038 to Inverness, where 26021 & 26022 took over for the run to Wick/Thurso and back. Bad weather caused the cancellation of the sea portion of the trip, but rapid substitutions were made, which led to haulage from 26033 over the Thurso branch. Inverness depot seemed leaner in terms of locomotives noted, mostly Class 26's, though more Class 47's were evident and a wandering 37098. South of Inverness 47038 did its thing via Aberdeen, 47020 backed on at Edinburgh but promptly failed. Haymarket turned out 40086, which was still going strong after we left the train at Manchester Victoria. 26022 & 26021 stand at Rogart early in the morning as the tour participants stretch their legs and attempt some photography under very indifferent lighting conditions. Due to the bad weather further north some participants left the tour here to take a bus tour to points of interest in north-west Scotland. Being a card carrying member of the 'Midland Railfans Club' meant there was no question of not joining their first venture in chartering a train, 'The Mid-Kylesman' to Inverness & Kyle of Lochalsh. 40012 did its job from Derby to Carlisle, 85020 to Mossend then 20039 & 20149 to Inverness. The trip included an early morning visit to the depot, which provided a fine array of Classes 08/25/26/37/40/47. The weather on this trip was warm & sunny all the way. 26022 & 26024 were called upon to take us on to Kyle of Lochalsh where a serious dent was made in the town's supply of ice cream & iced lollies. After returning to Inverness 20039 & 20149 were waiting to head south, and as usual we went via Aberdeen. 86011 took over at Mossend, replaced at Carlisle by 47475, which wandered over to Newcastle before picking up the regular NE/SW trail, though with a few Sunday diversions thrown in for good measure. Its a crowded scene at Achnasheen on June 2nd as 26024 & 26022 wait to cross a service coming from Kyle, the stop allowing the railtour participants the chance to expend much film on the tour train. It was a hot day, once we'd reached Kyle the first stop was to find something cold to drink! Having had so much fun on the previous 'Orcadian' it was only natural to book on 1980's tour and so take us on our next visit to Inverness. 47131 did the honours to Edinburgh, where 47273 took us over the Highland mainline to Inverness. Awaiting here were 26015 & 26030 for the trek to Wick/Thurso. Inverness depot provided a good selection of Classes 08/20/25-27/40/47. Assisting over the Thurso branch was 26038. Better weather this year allowed for the sailing portion of the tour to take place. The less said about this the better, yours truly doesn't sail well! Despite the northern latitude and the proximity to mid-summer the return journey was covered by either darkness or sleep, but 47273 returned us to Edinburgh and 47131 onward to Manchester. 26015 & 26030 pose for a photo-stop at Helmsdale on June 7th 1980. After the boat tour the railtour participants had free time in Thurso for various purposes. A walk up to the station found 26038 and a solitary BG waiting for their next turn of duty. Another camping trip to Scotland, visiting the same campsite at Bunchrew. More time was spent on photographing the Class 26 services, though the dull weather presented challenges. A couple of Class 27's were covered on the Inverness - Aberdeen services and a visit to Inverness depot on July 2nd found a good mix of Class 26/27 with 37/47's thrown in, though no Class 40's were present. An annual camping trip to the Inverness area made use of a campsite at Bunchrew several miles north of the Highland Capital. As luck would have it the railway line was at the end of the driveway giving easy access to photograph the services. Here 26045 pushes a failed 26022 on an Inverness bound service, July 2nd 1980. The swing bridge across the Caledonian Canal at Clachnaharry provides the background for this scene as a northbound service accelerates away from the speed restricted bridge. 26027 on my birthday, July 1st 1980. The view at Clachnaharry from the otherside of the tracks as 26027 accelerates away from the swing bridge on July 1st 1980. A rather tatty looking 26033 approaches Bunchrew with a southbound service on July 2nd 1980. With the tide out the picturesque Beauly Firth becomes the picturesque Beauly mud flats. As part of a tour of Scotland with a recently married bride an overnight stop was made at Inverness. The notebook doesn't reveal much of the trip, but Class 26/27's still filled the page at Inverness. 26026 heads west on an overcast afternoon with an Inverness - Kyle service. The train has just left Strathcarron, the station and the hotel are just below the group of trees at the rear of the train. The parked car is at the road end to the little hamlet of Achintee. When the worn out DMU's on the Aberdeen - Inverness service needed replacing, Class 27's and Mk1 coaches came to the rescue. Seen here on the final approaches to Inverness is 27005 on June 23rd 1981. A holiday trip to the UK included a tour to old haunts in Scotland. Renting accomodation at Cawdor allowed frequent visits to Inverness and the line to Aberdeen at Nairn. Still the Class 26's were soldiering on, as were the Class 27's, those at Inverness were frequently the former Edinburgh & Glasgow machines now renumbered. 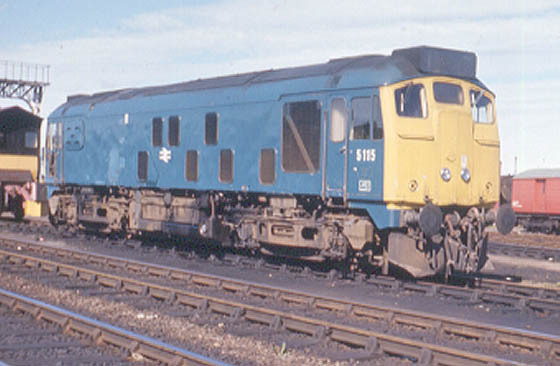 Class 37/47's were also common. A pair of Class 27's, led by 27053, are stabled to the west of the station, on the site of the old steam shed. Seen here on June 13 1985 27053 is one of the former Edinburgh - Glasgow Push-Pull locomotives. Renumbering: All received TOPS renumbering except 5114, 5122 & 5131. Blue livery: All carried blue livery with full yellow ends except 5122. Headlights & Tablet Catchers: All carried the twin sealed beam headlights and tablet catcher apparatus at some point. Fuel & water tanks: 5114-5120 original sized water tank, shortened fuel tank; 5121-5132 smaller water tank than 5114-5120 but same sized fuel tank. Modified headcode housing: 24127 'B' end only? 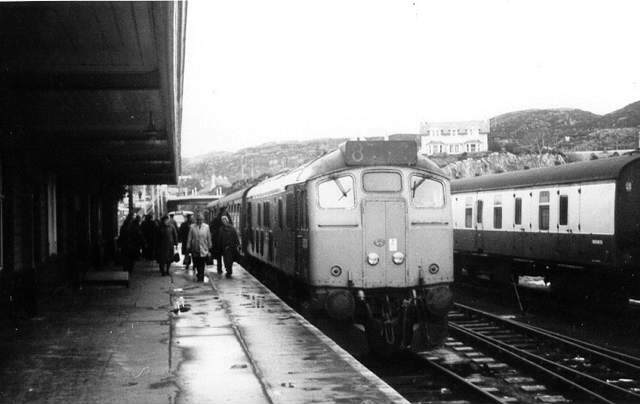 Its June 1972 at Achnasheen as a daily event occurs, the crossing of two passenger services. The 10.30 from Inverness waits as the 11.08 from Kyle approaches. Presumably on the same date as the above view another crossing takes place, this time the 17.50 from Kyle waits for the approaching 17.40 from Inverness. More views of Inverness based locomotives outside of the original Class 24 batch 5114 - 5132. The local dog checks out the new motive power at Lochluichart on an overcast day in 1961. Where once Black 5's roamed, now its the latest products from Smethwick and Derby that will provide the motive power for the next two decades. Although un-identified, the Class 26 already has its tablet catcher in place. Photograph courtesy E A Woods.